CHICAGO – How does a person reflect on their moment in the world? Actress Amber Tamblyn (“Joan of Arcadia”) found herself in such a point in life. Her new book, “Era of Ignition,” reflects upon her journey and in a macro sense, America’s journey in transition. Joe Arce took an Exclusive Photo of her at an event sponsored by Anderson’s Bookshop. CHICAGO – Russ Tamblyn has seen it all. In a show business career that is now over 60 years old, he has gone from child star (”Father of the Bride”) to Oscar nominee (”Peyton Place”) to classic role (”West Side Story”) and cult hero (”Twin Peaks”). With a span like that, he has collected a few stories. CHICAGO – In this edition of the HollywoodChicago.com Hookup: DVD, two lucky winners will win three DVDs each from Magnolia Pictures for the movies “Ira & Abby,” “The Great Buck Howard” and “The Answer Man”! CHICAGO – The film recently hit theaters, but we’re excited to present 25 admit-two run-of-engagement tickets so you can see one of HollywoodChicago.com’s most-raved films of 2010: “127 Hours” from Danny Boyle (the Oscar-winning director of “Slumdog Millionaire”)! And in this HollywoodChicago.com Hookup: Film, you can even see the incredible true story of Aron Ralston (as portrayed by James Franco) for free at the convenient time of your choosing! CHICAGO – What separates us during extreme danger? Why do some people collapse under the weight of likely death while others push forward and make it out alive? What fuels the will to survive to the point that it can do the unimaginable? 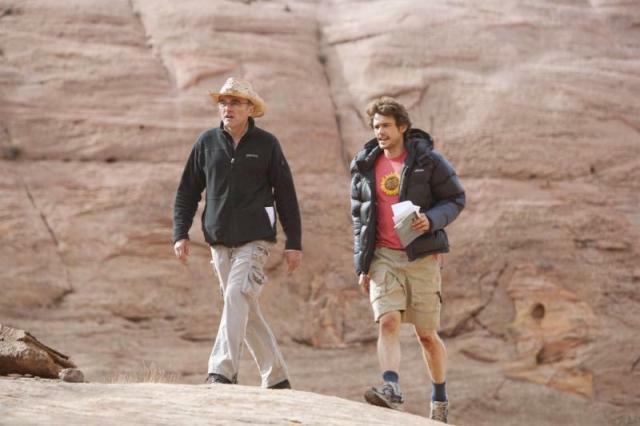 CHICAGO – This 14-image slideshow contains all of the official press images for the highly-anticipated “127 Hours,” starring James Franco, Kate Mara, and Amber Tamblyn. The film was directed by Danny Boyle. It will be released in Chicago on November 12th, 2010. CHICAGO – When Tina Fey made the jump from “Saturday Night Live” to “30 Rock,” she was planning on taking her talented co-star and friend Rachel Dratch to the award-winning show. Before the season began, Dratch was replaced by Jane Krakowski and the rest is history. CHICAGO – After the failure of the underrated “Life on Mars,” ABC brings another bizarre cop show to the same timeslot called “The Unusuals”. CHICAGO – ABC’s news series “The Unusuals” debuts next Wednesday, April 8th, 2009, but we have a sneak peek of the show starring Amber Tamblyn (“Joan of Arcadia”), Jeremy Renner (the upcoming “The Hurt Locker”), Harold Perrineau (“Lost”), Monique Gabriela Curnen, Josh Close, Kai Lennox, Eddia Alvarez, Terry Kinney, and Adam Goldberg. We have a clip called “Starter Kit” for you below. Check out the premiere on April 8th at 9pm CST.